Author: Me. Yes, what were you thinking ? The book based on my blog, is well ummm as exciting as the blog itself. You all know how I feel about food, recipes and stories. I think the three go hand in hand and there can never be one without the other. 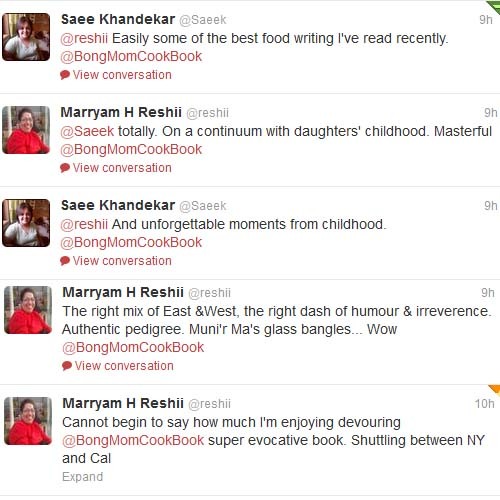 With similar thoughts, I did not try to write the book as a traditional cookbook. Instead this is what I write in the "Introduction" in the book and which I feel rightly surmises the book. "As I see it, recipes are a mere framework, guidelines to help you create your own food memories; to experiment and make it your own; to ﬁnd your own joy and spice box in the kitchen and to weave your own tale. That is what I want you to do with the recipes in this book. I did not write this book as a cookbook and the recipes shared here are those I cook at home according to the tastes of my family of four. When it comes to you, adjust, taste, create and, most importantly, enjoy the process, for the food is good but the story that you knit around it is better. This is my story, but it might well be yours and maybe even yours. " Of course it helps that there are many recipes in the book from Chhanar Dalna and Postor Bora to Kosha Mangsho to lure you in between. It is for you to decide what you want to do when you read. If you ask me, I would say, read the book and then go find your own spice box in the kitchen and weave your own story around the food you cook. The book will be available across stores in India and also on Flipkart from May. Soon after it will be available on Amazon and also as e-book for Kindle. I will update this page as soon as I get the know how. Book on FlipKart -- Get my Book now. 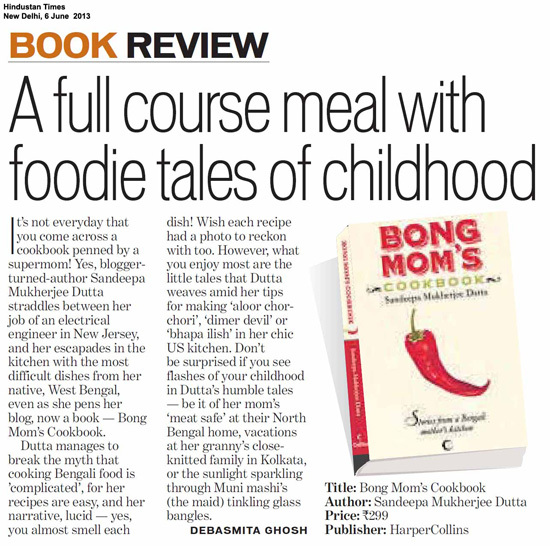 Time Out Mumbai/New Delhi/Bangalore -- "The book is semi autobiographical – it records Datta’s life, her past, her attempt at navigating the tricky turns of Bengali cooking, and her life as a working mother in the United States. In between are woven recipes .... Our other attempt at making the author’s mother’s version of gol morich murgi or chicken cooked with black pepper was also met with success. The few key ingredients required in the recipe such as fresh ginger garlic paste, freshly crushed black pepper powder, lime juice and ghee worked wonders for the chicken. The dish was ready in 20 minutes and the addition of fried onions was just what was needed to perk this light dish up. " Review at Blog "A Mad Tea Party" -- "A Bong Mom’s Cookbook could be a glimpse into your own life, more so if you are a foodie, and who isn’t one? I could relate to the anecdotes about childhood summer holidays filled with food memories. Isn’t it amazing how some memories are so clear in our minds? And their associations stay with us forever....The book is replete with such recollections and makes you nostalgic about days gone by. Even the mention of the brass pump-stove in her Chhoto Dida’s kitchen made me dreamy eyed! The book also chronicles the process of orienting oneself in a new world, the quintessential immigrant from India, in the landscape of America, the land (or superstore!) of mind-boggling choices. " "Giving a good glimpse of her life in New York and expertly comparing with the charming place where she spent her childhood (Bengal) with her parents, Sandeepa evokes such humour & wit that you really feel that she is like your best friend narrating her life story to you. What's more striking (which sadly missing from many Indian works) is the choice of words she uses to describe a scene." 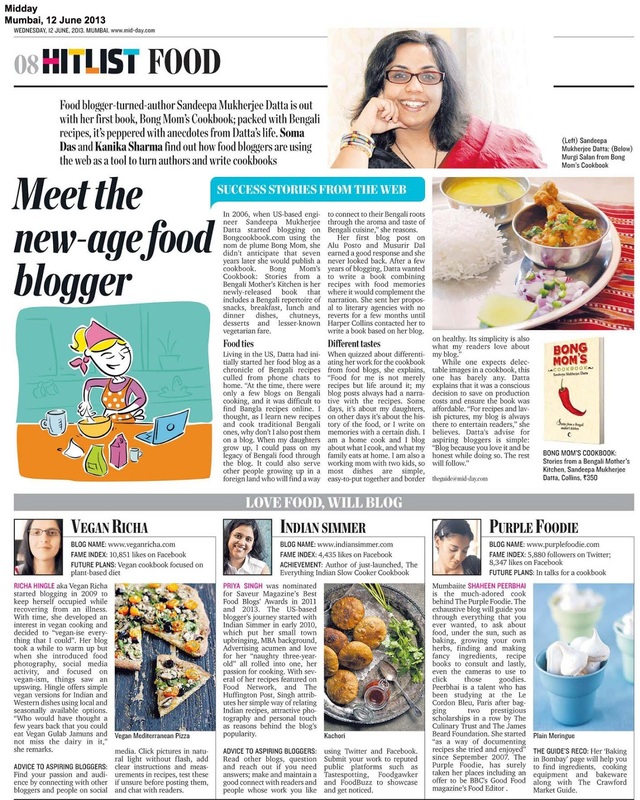 For a fun Q&A and more of the review visit "Cooking with Siri"
Here is the Mid-Day article where I share space with some more bloggers. 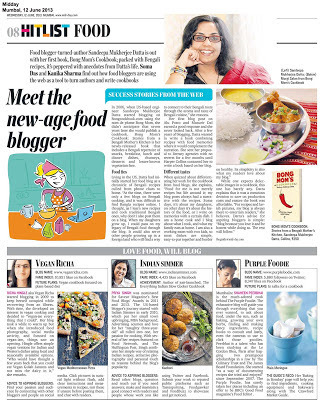 Shantanu David of The Indian Express loved my book, got introduced to Bong food and asked me some questions over e-mail. This is the article. Click on the image to read. She also reviewed my book and was very kind to host a giveaway for anyone who is in India. Check out her space and see what she has in store. 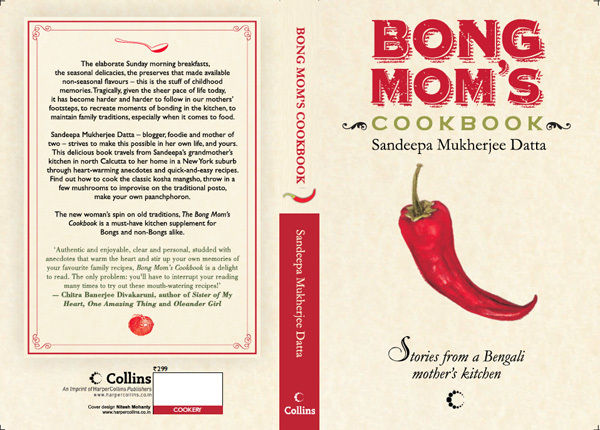 For the full review and Giveaway "Sin-a-Mon Tales"
"An easy narrative coupled with helpful and practical tips make a new Bengali cookbook a must-have in the kitchen." "Her heady mix? One part US-based nostalgia for Bangali cookery or ranna. Two parts real-time motherly zest for Sukumar Ray and rooted-in-India culture. Garnished liberally with humorous anecdotes, starring an extended cast of family and friends, her husband (also known as H-man), and her two twinkle-tongued little daughters. Her light touch ensures that the fare dished up works like magic. Via kitchen and blog, she busts the myth that Bengalis survive on a diet of fish and rosogollas." What Chitra Banerjee Divakaruni had to say is so true!..I had enjoyed cooking from your pages during the RCI Bengali that you hosted!..Congratulations again Sandy..so excited to read about this. Am so happy for you. I follow you blog very regularly and have tried so many of your magic recipies. Will grab one for sure :) Is this book available on Amazon once it releases? Hearty Hearty Congratulations. All your hard work and sleepless nights paid off. Wowo congragulations and i am looking forward to the day ot comes in Amazon. Congratulations !! a big inspiration .. a heartful of joy .. nostalgia ..
Congratulations sandeepa!! way to goo!! When will it be available in our tiny island (Amazon UK)? Can't wait to get a copy. Congratulations once again! Congratulations Sandeepa. Waiting eagerly for a copy. God Bless. Cannot wait to buy this book. Will save me printing out recipes and putting them into a notebook! Congratulations, Sandeepa! You totally deserve this. Love the cover ... fit for a bengali cookbook... Cant wait to get it for myself and all my friends who are a big fan of your cooking ... Congratulations once again ... You truly deserve the best, God bless u for bringing smile in so many lives. I somehow missed this! Looks awesome,love the cover. Congrats Sandeepa and here's wishing it a great success. well done... inspiration to bong mom in sydney as well. When I discovered your blog, I felt I'd arrived in heaven! 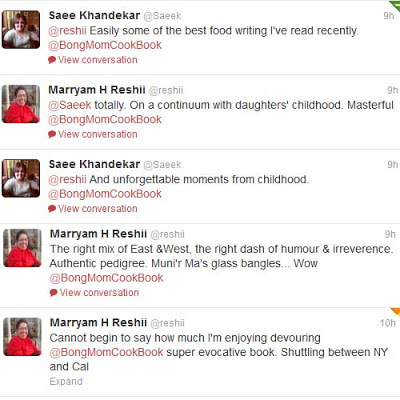 Thank you for sharing your recipes with us and congratulations on the imminent publication of your book. I'll look out for it on Amazon - hope it'll be available on the Amazon UK website. Superbbbbbbbb idea!!! I'm so happy to read about your book...your blog has been so enjoyable and I'm sure the book will be even better..Congratulations for your endeavour!!! SO finally its out of your system! how do u feel now? I have loved your blog since i stumbled upon it in 2010... Feels nice to know this really happens! The book is out of stock on FlipKart..... any other online place to buy it? Many many congratulations! Will keep an eye out for it on Amazon. BTW CBD reviewed your book. How awesome is that!! Why am I so late??? Hugs, San!! Well done, congratulations, brilliant!! I will keep a watch for it on amazon. Sandeepa - All the best for your book!!! I can see the preorder option in Flipkart!!! I have been following your blog since 2007 and have tried out numerous recipes. Congratulations on your awesome achievement! Looking forward to getting a copy and the bliss that would follow. Wonderful and congratulations! When I was in the US, I used to dish out your recipes , coming out of the laziness I had, to prepare the regular fare! I've followed your blog for about 2 years now. The recipes are lovely, but the stories that accompany them are even more precious to me. They bring back memories of lazy summer vacations spent at my Dida's, of meals that were taken for granted back in childhood, but those I miss dearly today. Yours will be the first cookbook I will be purchasing ever and I cannot wait. Congratulations and keep writing. and many thanks for sharing these wonderful recipes over the years. couldn't wait for the amazon ed ... so pre ordering and i suppose 'importing' it when it's released. Im neither a bong nor a mom nor a cook.. but i can justify having a flavour of all three combined:) born and half raised in Calcutta makes me a bong at heart, love for food(cooking and eating) follows naturally and credit to my maternal instincts for making me a sub-mommy..!! Well Ms Sandeepa, i had liked your fb page quite sometime back but hadnt followed you closely until recently.. and i must say im amazed..inspired to the extent of rising from my bed where i was tucked in to sleep after a long day just to come and post a comment and a token of thanks..!! its not just your recipes or slurpy pictures that attract me but the feeling behind each post of yours that makes me come back again and again to your blog and brighten my dull day :) you seem to be so much at peace with your own self it amazes me and reflects completely in your blog :) kudos..!!!! I'm a foodie, love to eat,cook and talk about food! Love your (slightly different) recipes, and have tried many in my kitchen. Also love your whimsical, anecdotal writing style. Perusing your blog pages is sheer pleasure whether or not I plan to cook anything ! Congratulations Sandeepa! Came here from Anita's review of your book. Hi Sandeepa, Can we get a copy here in Cross word ? I just love you and your food! Ofcourse even i am a bong foodie! Still have not received your book. called flipkart to enquire. Since thier system was down, they promised to call back. I follow your blog on regular basis from last 4 yrs. Bong Mom, do you plan to bring it out on Kindle? I just completed reading this book.This is not just a conventional cook book of drab recipes.The book explodes with myriad colour of emotions and characters attached to each item of dishes & recipes. Sandeepa has successfully ventured into a new style of narration. The contents move in and out of the present and past and this has been appealing fact to me. The author manages to breath life into each one of the recipes in simple poetic writing style. The recips are clear and in ready to make detail.In one word the book is "Beautiful". Get a copy and read it keeping in mind that it is not just about cooking only but much more than that.You can not aught to miss this! Best wishes for Sandeepa. Wish more such presentation from next time. Thank you so much for the beautiful words. Would love to know who you are. Also can you please post a review on Flipkart and Amazon for the book. Thanks again. congratulations. I have been following your blog and trying out your recipes for years now ( my hubby follows you on twitter) and I must say your book will be a best seller in no time at all. I wish there was a ebook avaialble. So much easier to refer to and use. Think about it. Myself Preeti, food blogger of Simply Tadka… First of all big congratulations on your achievement as blogger to become a successful author… I got your lovely Bong Mom’s cook book copy through Indiblogger; now want to publish book review on my blog Simply Tadka. For that I need your permission to take little content about yourself from blog. Thanks Preeti. Let me know what you need. You can e-mail me also. Hi Dear..Thanks for responding check this link, hope you like it... its a simple and first trial from my side if I did any mistake please reply me... I will update. Congratulations!! !That's awesome. i saw this book being reviewed in some blogs and had to come by and congratulate and to check out your blog. Bong khaana is awesome with it's complexities, can't wait to take a look at your book. Just finished ur book.loved it so much.while reading I kept on drifting into the days of my childhood.I have been following ur blog and trying a whole lot of ur recipes .But with the book u have given me a chance to stray into my life in India. This book helped me miss home and Ma a little less. God Bless u. A visit to Park Street is a must whenever I happen to be in Kolkata, browsing around in Music World (heard the place is closing down) a snack in Kwality and really expensive "cha" in Oxford surrounded by scores of books is my kind of lazy afternoon that I thoroughly enjoy. I picked up the book this June and am thankful to myself for having done so. Apart from the juicy stories and delectable recipes, the book is a fantastic stress buster. With me, my family of four (now three - my wife Soma left for heaven last year after keeping me delightful company for twenty five memorable years) have gone through the adventures of living in strange remote areas in the Andaman Islands and have been part of experiments that we indulged in, to produce food on our table from whatever we could pick up from the market, backyard, others' backyards and even from the jungle, to which I have easy access as a forest officer. With the children now in colleges in the mainland, I am not a frequent visitor to the kitchen anymore, but reading your book has been giving me the same passionate pleasure as creating attractive and tasty food does. Your book is wonderful Sandeepa. I am reading it right now:):) It is a pleasure to read. I ordered it for two of my non-Bengali friends who are getting married this year. I loved your book :) I read about it from Mad momma blog and ordered it immediately from flipkart. It arrived within 2 days and I just couldnt put it down. it really gave me an insight into bengali cuisine and i even tried out the masoor dal with paanch phoron. It was lovely. Congratulations on such a wonderful first book!!!! congratulations! !I came across your blog while in the US and newly married to a bong 7 years ago.I would come back to your blog again and again for so many bengali delicacies as well as for advice on the political correctness of the foron i had decided will suit the dish I am about to make. I am so happy to know that your blog is published as a book now!!! I also stumbled across your blog 6 years ago when I was 18 and wanted to cook badly. This was the first blog that I always came across whenever I needed a recipe. I subscribed and since then, I'm a die-hard fan of your blog. Your blog was the one that I always turned to when my mom wasn't available to answer all my queries and give me the recipe from top to bottom. Whenever I read your blog, it makes me feel like I'm home and in the kitchen where I can see my mom and granny cooking. Congrats on your book and I had no idea you wrote a book too. I just saw it today on Amazon and immediately bought it :D It is something I will always cherish and keep with me, no matter which part of the world I go to! Thanks for the lovely work and appreciate the effort, Sandeepa! :D Keep the recipes coming up! I also stumbled across your blog 6 years ago when I was 18 and badly wanted to cook. This was the first blog that I always came across whenever I needed a recipe. I subscribed back then and since then, I'm a die-hard fan of your blog. Your blog was the one that I always turned to when my mom wasn't available to answer all my queries and give me the recipe from top to bottom. Whenever I read your blog, it makes me feel like I'm home and in the kitchen where I can see my mom and granny cooking. Congrats on your book and I had no idea you wrote a book too. I just saw it today on Amazon and immediately bought it :D It is something I would always cherish and keep with me, no matter which part of the world I go! Thanks for the lovely work and appreciate the effort, Sandeepa! :D Keep the recipes coming up! is it also available as an e-book on kindle? I just bought two copies: one for me and one for my mum. Yay! So excited to get them! I love this book!! I use it all the time. It is easy to understand, clear with ingredients and I love the little stories! great job!! Absolutely loved your book. I am a bong mom too but have avoided cooking for so long (far too long maybe). Your stories brought my entire childhood alive to me. I recognised myself in almost every incident that you wrote about and the connection that we have to food. And (deep breath here) have inspired me to try a couple of recipes from your book. Lovely reading. Plan to gift this book to a couple of my friends and sisters who have found themselves out of kolkata. Your book is a must have in any bong's kitchen. Even though I have a range of expensive cook books for different cuisines but I allways love to prepare something following a recipe from your book. I can trust the recipes blindly as I know any one I pick grom the book the dish will be delicious. There are hardly any good bong recipe books in market and yours is a gem. I liked it it so much that I gifted another copy to my sister.